Tara and Susan before the race start. Tara is wearing a red ball cap. Susan is wearing sunglasses and a bright blue t-shirt. For the last three years, I have done the sprint duathlon. In 2015, I had not done any training and found the transition from the bike to the second run to be particularly troublesome. Last year I did some training in anticipation of that transition. However when I started the second run, my feet felt really flat and I had difficulty running. I attributed this to my somewhat overused running shoes and opted to finish the race in my bare feet. In hindsight, the problem was not my sneakers. In April, I was diagnosed with Parkinson’s disease. My symptoms include an inability to make my right foot do what I want it to do. I now think this is why I had difficulty last year. I used to like running. Now I find it frustrating because it just doesn’t feel normal. I almost bailed on the race this year, but my cousin Tara convinced me to participate. I decided that I would enjoy the morning, hanging out with my friends and fellow competitors. I walked most of the second leg, enjoying the sunshine, the views of Lake Huron and the amazing support from everyone involved. Fellow competitors, volunteers and strangers on the street smiled, waved, honked horns, and yelled words of encouragement as I passed by. I had fun. I don’t know if I’ll do the race next year. I’ll decide how I feel closer to registration but I might volunteer if racing seems like too much. 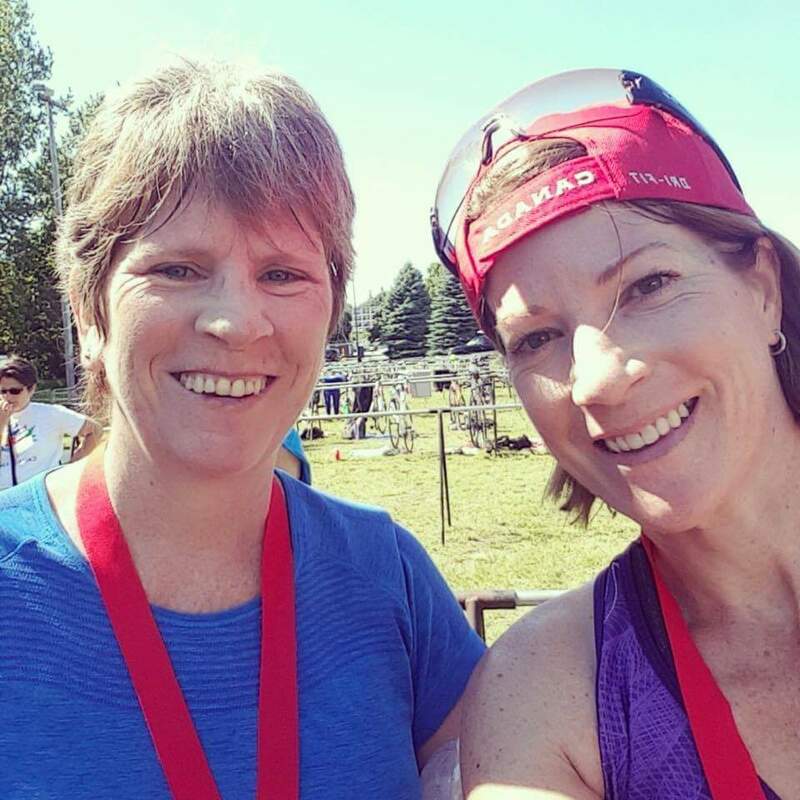 Susan (left) and Tara (right) post race, smiling, with their medals. Susan Fullerton, a lawyer working for the government, lives in Toronto. She is an avid traveller who has had varying levels of fitness throughout her life. These days, she’s focused on being a reformed hoarder, trying to make better choices about how she spends her time and money. I’m sorry I missed the event and seeing you! 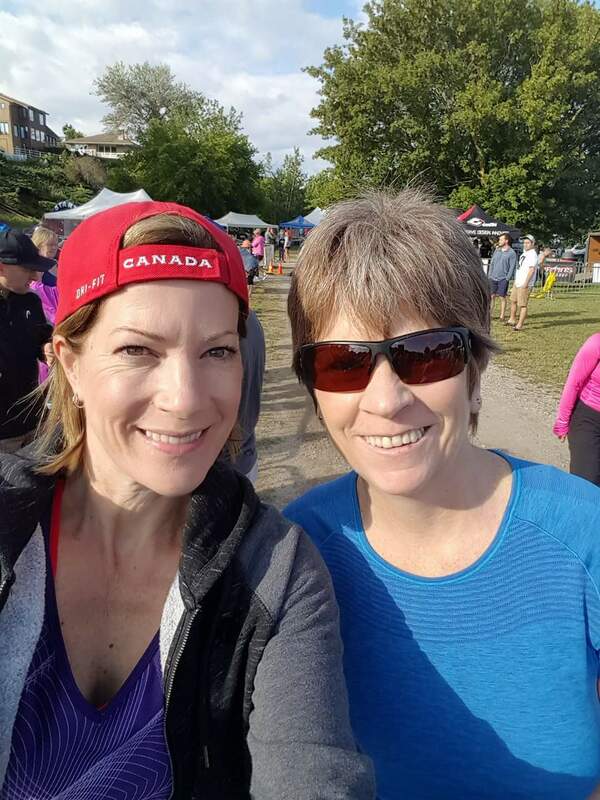 I walked a duathlon with a friend last month. We were celebrating being vertical and moving forward. If ever you want a walkin companion for an event let me know!